BCIndex BCIndex=(/1,2,3,4,5,6/) INTEGER MANDATORY The BCIndex parameter assigns a bondary condition to each surface of the cartesian box in order of the surfaces. The number of a vector's component represents the nth boundary condition in order of its position in the file. Hence, each position refers to the six box sides (/z-,y-,x+,y+,x-,z+/). In this example six different boundary conditions were assigned to the box surfaces. In case of a boundary condition defined on several faces, the components belonging to these faces will be equal in the BCIndex vector. In case of multiple cartesian boxes there are surfaces which coincide with other ones. To such surfaces no boundary condition can assigned. Therefore, The number of the corresponding vector's component is set to 0. For example, if all components of the parameter BCIndex are set to 0 ("(/0,0,0,0,0,0/)") the box will be surrounded completely by six other boxes so that no boundary condition can assigned to a single surface. For a periodic boundary condition the component Type has always to set to "1". The fourth component alpha assigns a displacement vector vv and its direction (-/+) to the periodic boundary. An alpha of "-1" means that the first ("1") defined displacement vector is assigned to this surface in the opposite direction ("-1") as he was defined. For curved-structured meshes the component curveIndex has to set to "1". 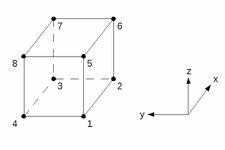 if Mode=1 Coordinates of the box's corner nodes in the three-dimensional cartesian coordinate system. For proper operation the nodes have to be in the order as illustrated in Figure 1 at the right and each node with x,y,z coordinates. Furthermore the corner nodes define the six surfaces of the cartesian box, see table below. curvingMethod curvingMethod=1 INTEGER 0 0: No curving method activated. 1: Curving with normal vectors at surface points. 3: Curving with subdivided surface mesh. Debugvisu Debugvisu=T LOGICAL F T (True): Files will be generated, which enable you to visualize the mesh and the boundary mesh for debugging. These files can be found in the directory of the executed parameter.ini file. F (False): Files for visualization will not generated during executing of the parameter.ini file. DebugvisuLevel DebugvisuLevel=1 INTEGER 0 0: Visualization of linear mesh and BC (default). 1: Visualization of linear mesh and BC and an additional curved surface visualization (_SplineSurf. *) if useCurveds=T. 2: Visualization of linear mesh and BC and an additional curved volume visualization (_SplineVol. *) if useCurveds=T. doExactSurfProjection doExactSurfProjection=F LOGICAL F T (True): Project high order nodes onto analytical description of the surface. DXmaxToDXmin DXmaxToDXmin=(/6.,100.,1./) REAL (/0.,0.,0./) This parameter specify the frame ratio of the maximum element size to the minimum element size for the stretched element arrangement for curved-structured meshes. The value 1 is used typically for a deactivated stretching. fac fac=(/1.5,2.2,10/) REAL (/0,0,0/) Stretching factor of the elements in the direction of the turned local cylindrical coordinate axis. The value 0 is only allowed if the stretching function for this axis is deactivated (stretchType vector component for this axis is 0. A value of the intervall means a decrease. The value 1 does not affect the element sizes and means an deactivation of the stretching function for this axis. A value means an increase of the element size in the direction of the coordinate axis. Furthermore the stretching behaviour can be mirrored by adding a negative sign to the values. If the stretchType vector component for an axis is 3, the factor will be multiplied by -1 if the half distance is reached. In addition, fac has not the significant influence on the element arrangement anymore but the parameter DXmaxToDXmin. factor factor=(/-1.75,1,-1.5/) REAL (/0,0,0/) Stretching factor of the elements in the direction of the cartesian coordinate axes. The value 0 is only allowed if the stretching function for this axis is deactivated (stretchType vector component for this axis is 0. A value of the intervall means a decrease. The value 1 does not affect the element sizes and means an deactivation of the stretching function for this axis. A value means an increase of the element size in the direction of the coordinate axis. Furthermore the stretching behaviour can be mirrored by adding a negative sign to the values. A combination with the parameter l0 ignores the element number of the defined box. if Mode=3/4 The name of the external mesh file. The belonging files have to be available in the directory of the executed parameter file as *.cngs files. jacobianTolerance jacobianTolerance=1.E-16 REAL If Jacobian at a sampling point is lower than this value, a bilinear or curved element is considered broken. l0 l0=(/0,1,5,0/) REAL (/0,0,0/) The length of the first element of a stretched element arrangement of a cartesian box. Each component of the vector stands for an axis of the cartesian coordinate system. The value 0 means an deactivation of the stretching function for this axis. A negative sign defines the length of the first element of the other side of the box. A combination with the parameter factor ignores the element number of the defined box. nAnalyze nAnalyze=5 INTEGER BoundaryOrder+2 Number of points used for mesh analysis, e.g. defines the number of points to sample an elements' Jacobian if checkElemJabians is active. 1: Reconstructed (no additional parameters, CurveIndex of BC must be >0). nSkipZ nSkipZ=2 INTEGER 1 If mesh is z-extruded a different skip can be given in z-direction. NVisu NVisu=5 INTEGER 0 Number of visualization points per element edge if useCurveds=T. ProjectName ProjectName=cartbox STRING MANDATORY Part of the output files' name which will be generated during the execution. These Files can be found in the directory of the executed parameter.ini file. if Mode=11 Inner radius of curved structured mesh. The Value 0 is not allowed. SplitToHex SplitToHex=T LOGICAL F If SplitToHex=F then tetrahedra and prisms are subdivided to yield pure hexahedral meshes meshes. Hexahedra are also subdivided to guarantee a conforming connection. NOTE: Pyramids cannot be split, this function cannot be used with pyramids present in the mesh. stretchType stretchType=(/3,1,0/) INTEGER (/0,0,0/) This parameter manages the (de)activation of the stretching functions for all axis. For this reason the parameter is a vector with three components. 3: Stretching in direction of the axis is activated and from the second half of the mesh distance on the stretching factor is multiplied by -1.
vv vv=(/0,0,1./) REAL (/0,0,0/) The displacement vector has to specify in the three-dimensional cartesian coordinate system and has to be normal to a surface the vector was assigned to. In addition the displacement vector has to show to the inside of the cartesian box. In case of two parallel surface-planes, both with periodic boundary conditions, just one displacement vector has to be defined. Therefore the different directions of the vectors can be compensated by switching the sign of alpha, the fourth component of the BoundaryType vector. The displacement vector has to be as long as the distance between the surfaces the vector was assigned to. The index of a displacement vector is defined by the position of its definition like the parameter BCIndex. Several definitions of boundary conditions between two definitions of displacement vectors will not affect the index of the displacement vectors. zLength zLength=1.0 REAL 1 Change (3D) or define (2D) length of domain in z-direction. zperiodic zperiodic=T LOGICAL F T (True): The Boundary conditions z_plus und z_minus are set to periodic ones. F (False): The Boundary conditions z_plus und z_minus remain non-periodic. This page was last modified on 14 September 2015, at 20:47.